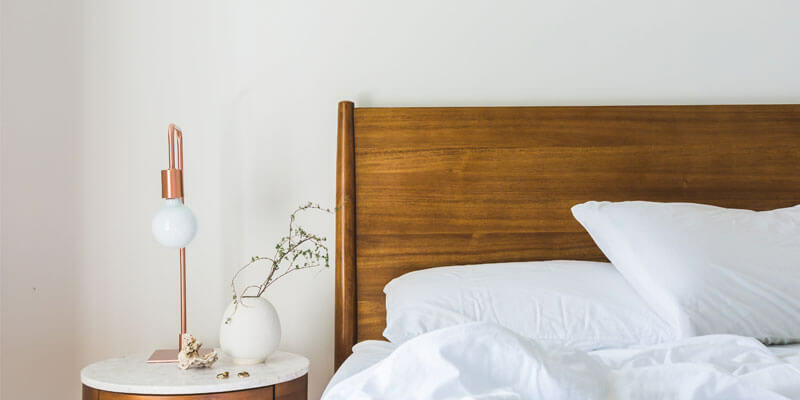 A small bedroom can really provide you with the best of both worlds, offering a cosy place to relax in, whilst also providing an anxiety-inducing atmosphere when things start to build up and get untidy. So what do you do? One thing worth investing your time into is learning how to create storage in a small bedroom. Incredibly, most of the ideas that you’ll come across are actually free or have little financial commitment associated with them. And the trick is . . . The trick to getting the most out of small spaces is a good layout and initial product design. Unfortunately, if you have a small bedroom, the chances of having a lot of larger items available to you are significantly reduced. Here at FURNICHE® we find that making the most of smaller items of furniture tend to go a long way and can frequently surprise you with the amount of storage that they have available. As well as furniture size and shape, consider the colour schemes in your rooms. It’s no secret that darker, bold colours psychologically make a room appear smaller. Using brighter colours can help you create the illusion of space, making the small bedroom seem bigger. We’re going to run through a few things that you can do to help create storage in those smaller spaces. Some will need a lot of time, whereas others can be added instantly which is fantastic. When you’re learning how to create storage in a small bedroom it can be easy to forget your main priorities and stick to the larger items in the room. However, there are other things that you can do. Natural sunlight can make a small room appear bigger. Make sure that the furniture within the room is in a position that allows natural sunlight to flow without causing shadows. One of the easiest and quickest ways to add extra storage to a small bedroom is through adding shelving. Shelving units provide that extra space, away from the floor to store a variety of items including clothing, toys, stationary and more. Unfortunately, shelving units can come across as a bit of an eyesore. However, high-rise shelving units that have been purpose built for storing small items are perfect for small bedrooms. Placing the floating shelves up high keeps them out of sight, making the room appear less cluttered, providing a larger illusion. You can install high-rise shelves above doors or around the base of the ceiling. These forms of shelving units are great for small children’s bedrooms as they are the perfect size to store toys, books, games and cuddly toys. The one thing that is always guaranteed to be in a bedroom is a bed – I think that’s pretty clear. So why not consider turning that bed into a self-made storage facility? Small bedrooms compromise their space and a double bed is guilty of taking most of it. It’s a little cliché but it fits; small things matter. Look into have a custom bedframe built that includes some clever storage spaces. You may not think there are too many available and you’d be right, but there’s no reason why you couldn’t look into having a bespoke bedframe built. If you’re a little DIY savvy then there’s why not look into building one yourself? Now then, one thing that is easily available is storage bedframes and they’re one of the simplest storage hacks for small bedrooms because they’re so easy to use and fit. A lot of the storage bedframes available come with internal drawers as standard, usually two or three on both sides. However, more recently the mattresses themselves can be extended up to reveal a storage area underneath the bed itself. If you have the budget then you could consider purchasing an upright bedroom. These are designed to camouflage into the rooms surroundings and you simply release a lever and pull the bed down to use it. Part of learning how to create storage in a small bedroom is by utilising the hacks that are already available and custom built sliding wardrobes is right up there. Unlike traditional wardrobes and storage cabinets, these fitted items come with additional internal storage spaces for clothing, shoes, boxes and more. Freestanding wardrobes tend to become a little flaccid over time and have been known to lose their shape. However, fitted wardrobes and some of the sliding wardrobes in Milton Keynes that we’ve built and installed still stand strongly today, years after the initial installation. Most custom built wardrobes can be tailored to any room, no matter what shape of size. They are installed onto the fixtures of the wall and ceiling, secured into position, leaving you with extra space available for other items or uses. If you have a small bedroom then we feel your pain . . . However, using some of the ideas that have been mentioned in this weeks article will put you in good stead and a great position to maximise the space that you have available. Try to avoid using large, bulky items to decorate and furnish your room. These can make the room seem cluttered and smaller than it already is. Maximise the use of light colours and natural sunlight. Lighter colours can provide your eyes with an illusion, making the room appear bigger. If you insist on using a darker shade when decorating, make sure that the dark colours are applied sparingly to smaller sections of walls and ceilings. Use the brighter colours to paint and decorate the larger areas. A great alternative would be to use small domestic plants. You’ll be surprised at how a small house plant can brighten a room and make it seem larger than it actually is.